Good morning everybody and thank you for the opportunity to share with you some of the main findings of this report creating impact and whenever we start to talk about impact investing we need to ensure that we're starting from a common understanding of what we mean by the term. It's a label that is commonly used but sometimes people are confused between what is sustainable investing versus Responsible Investing versus other types of investing. So we use this a definition which we believe is commonly accepted across the industry. And this is a definition which describes three things that impact investors do differently from other investors. Firstly they have an intent to create social and environmental improvements through their investments. Secondly they make a contribution to the achievement of those improvements either through the capsule they provide or other forms of value they provide to the companies. So already we can see this goes beyond just investing in companies which have impacts and impact investing actually has a thesis for how that investment makes a difference to the company's ability to impact. And thirdly impacts investors measure what they do and measure the improvements that they make to impact just as they would on the financial side measure their financial returns. And that can be at the level of the company in the project so it can be the level of the systemic change which they make at market level which is something that in our new framework that IFC now attaches more attention to so using this definition whether it's the size of the market today. Now this turns out to be a challenging question to answer because most of the surveys so far have the live on self reporting and the reporting doesn't necessarily follow this consistent definition. So let's before we take a different approach and we actually use public data sources and use the screens of this definition. So I actually fell for those investments which have these attributes of intense contribution or measurable improvements. So what we find we find that the number of different brackets here which have different elements of the attributes firstly of the top left we have 71 billion dollars in five impact funds. This is what people think of. 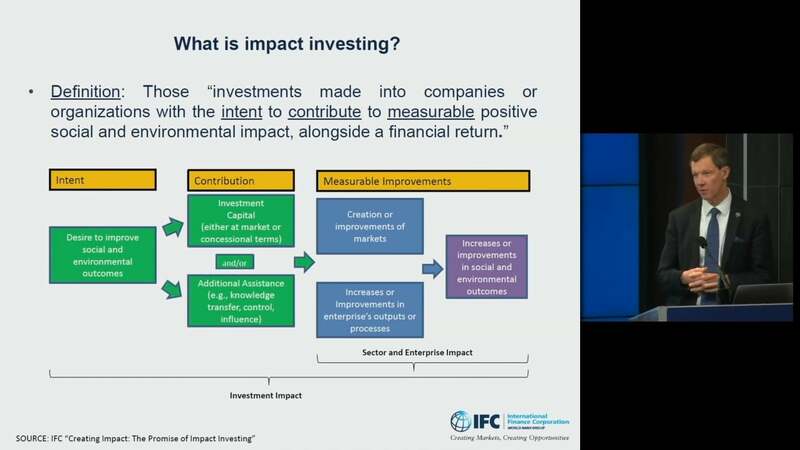 First and foremost most think about impact investing today has all the attributes of definition but it's small in the context of over all capital markets because most investors put their money into the public markets not into private equity and Veth. So if we look at the public markets we see two investment approaches which at least have the potential to have impacts and some investors may be using to drive impact but we can't today measure how much of it is being used for impact. The first type is activist shareholder strategies and public equity markets which is and they fill in the market today and that that can be a strategy for driving impacts if the investor has that intent. And secondly as Felipe mentioned the green and social bond market which is rapidly growing and which shares many of the attributes of impact investing but what we've tried to do also and this will force us to take a broader lens on the impacts investing and recognize that when you look at the mandates of development finance institutions and their private sector operations they also share these attributes of having an intent for social and environmental impacts from making a contribution to the impact of the companies they invest in. And for the most part at least for some path measuring and reporting on it. So there's a group of 25 deifies who have agreed to a common framework for measuring impacts called hips and they collectively manage about 740 billion dollars collectively both investments for their own accounts and what they mobilise from private investors. And then beyond that there's a bigger world of another 80 or so development banks who collectively manage about three trillion dollars and not too much is known about what the how they manage those funds in detail but they have some kind of a policy or social mandate which gives them at least some of the attributes of being an impact investor. So today we can't come to one total number because we don't know what proportion of investors in some of these these brackets actually investing. But what we can say is that we think that the market today is much smaller than its potential and the reason that we say that is because in the report we actually look at what is the appetite of investors today when given the choice to invest in an asset which has some sustainable responsible elements to it. What do we see.